My lab studies how networks of nerve cells produce different behaviors and how these neuronal networks are established during embryogenesis. We use electrophysiological, imaging, anatomical, computational, and embryological techniques to characterize these circuits in the relatively tractable nervous system of the medicinal leech, and to construct computerized models of them. Briggman K.L., Abarbanel H.D.I., Kristan W.B. Jr. (2005) Optical imaging of neuronal populations during decision-making. Science 307:896-901. Kristan W.B. Jr., Calabrese R.L., Friesen W.O. 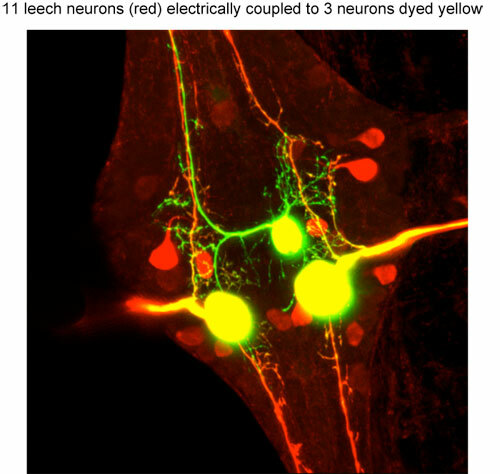 (2005) Neuronal basis of leech behaviors. Prog. Neurobiol. 76:279-327. Thomson E.E., Kristan W.B. (2006) Encoding and decoding touch location in the leech CNS. J. Neurosci. 26:8009-8016. Briggman K.L., Kristan W.B. Jr. (2006) Imaging dedicated and multifunctional neural circuits generating distinct behaviors. J. Neurosci. 26:10925-10933. Marin-Burgin A., Kristan W.B. Jr., French K.A. (2008) From synapses to behavior: Development of a sensory-motor circuit in the leech. Special issue of Dev. Neurobiology 68:779-787. Baca S.M., Marin-Burgin A, Wagenaar D.A., Kristan W.B. Jr. (2008) Widespread inhibition proportional to excitation controls the gain of a leech behavioral circuit. Neuron 57:276-289. Briggman K.L., Kristan W.B. Jr. (2008) Multifunctional pattern generating circuits. Annu. Rev. Neurosci. 31:271-294. Bill Kristan received his Ph.D. from the University of Pennsylvania. He was a postdoctoral fellow at Stanford University and an assistant research biologist at UC Berkeley. He held a Guggenheim Fellowship and was a Fellow of the University of Bielefeld, Germany.